We are renowned Manufacturer, Exporter and Supplier of Coconut Shell Ice Cream Cups. 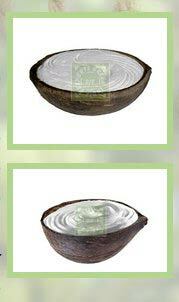 We manufacture Coconut Shell Ice Cream Cups after cutting the coconut and removing coconut pulp from it. Further, the outside and insides are well polished, washed and treated, so that the smell is neutralized. The shells for Coconut Shell Ice Cream Cups are then segregated according to their volumes. Later on, these shells are dipped in food-grade chlorine solution and once again washed in fresh clean water. The shells of Coconut Shell Ice Cream Cups are then dried naturally and hygienically packed. Our Coconut Shell Ice Cream Cups are absolutely free from any pulp, dust or smell.